Astronomers reveal that a small, recently discovered asteroid — or perhaps a comet — has entered our solar system from somewhere else in our galaxy. If confirmed, it would be the first “interstellar object” to be observed by astronomers. A/2017 U1 was discovered October 19 by the University of Hawaii’s Pan-STARRS 1 telescope on Haleakala, Hawaii, during the course of its nightly search for near-Earth objects for NASA. Rob Weryk, a postdoctoral researcher at the University of Hawaii Institute for Astronomy (IfA), was first to identify the moving object and submit it to the Minor Planet Center. Weryk subsequently searched the Pan-STARRS image archive and found it also was in images taken the previous night, but was not initially identified by the moving object processing. The object approached our solar system from almost directly “above” the ecliptic, the approximate plane in space where the planets and most asteroids orbit the Sun, so it did not have any close encounters with the eight major planets during its plunge toward the Sun. On September 2, the small body crossed under the ecliptic plane just inside of Mercury’s orbit and then made its closest approach to the Sun on September 9. 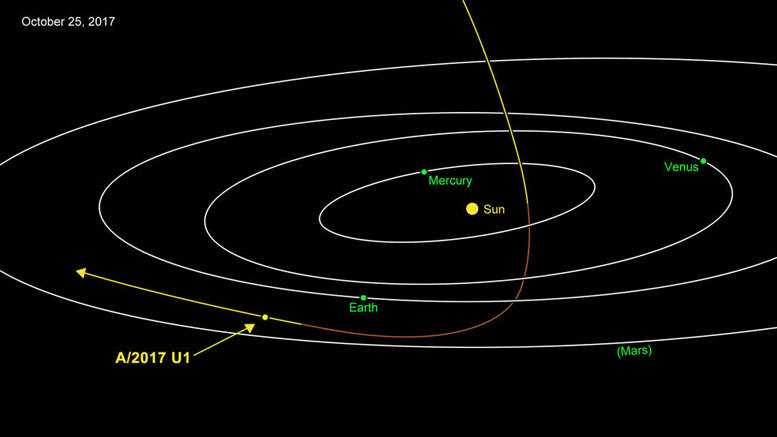 Pulled by the Sun’s gravity, the object made a hairpin turn under our solar system, passing under Earth’s orbit on October 14 at a distance of about 15 million miles (24 million kilometers) — about 60 times the distance to the Moon. It has now shot back up above the plane of the planets and, traveling at 27 miles per second (44 kilometers per second) with respect to the Sun, the object is speeding toward the constellation Pegasus. “We have long suspected that these objects should exist, because during the process of planet formation a lot of material should be ejected from planetary systems. What’s most surprising is that we’ve never seen interstellar objects pass through before,” said Karen Meech, an astronomer at the IfA specializing in small bodies and their connection to solar system formation. The Panoramic Survey Telescope and Rapid Response System (Pan-STARRS) is a wide-field survey observatory operated by the University of Hawaii Institute for Astronomy. The Minor Planet Center is hosted by the Harvard-Smithsonian Center for Astrophysics and is a sub-node of NASA’s Planetary Data System Small Bodies Node at the University of Maryland. JPL hosts the Center for Near-Earth Object Studies (CNEOS). All are projects of NASA’s Near-Earth Object Observations Program, and elements of the agency’s Planetary Defense Coordination Office within NASA’s Science Mission Directorate. 1 Comment on "A Small Object (A/2017 U1) from Deep Space Enters Our Solar System"
Any chance this could be a thing like Clarke’s Rama? Apparently it’s not very big; could it possibly be an extraterrestrial probe?